The membership of the World Economic Forum (WEF) that meets each year in Davos, Switzerland, includes the CEOs of most of the world's most powerful corporations. In addition to being the engines driving globalization, these corporations are the cause of much of the world's economically induced environmental damage, mounting debt and escalating impoverishment. They also are responsible for the growing concentration of wealth and the enormous prosperity that has come to about 20 percent of the population in many countries in the world. But with all of this power comes the responsibility and the resources that could make a difference in creating a better and more just world. Perhaps it's time we began looking at Davos as a resource, rather than just a protest venue. After all, the WEF brings together corporate, government and media elites in a denationalized space where national passions can be put on the back burner for a few days and global issues can be confronted: issues such as mass poverty and worldwide environmental degradation, issues that will require enormous talent, leadership and resources--all of which the elites at Davos proudly tell us they have. 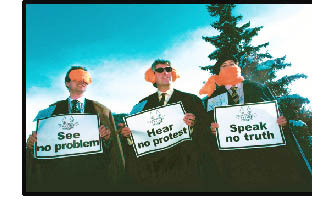 Protesters from Friends of the Earth in Davos. meetings of mostly European corporate and political elites, largely as a way of resisting the growing power and influence of the United States--that gorilla on the other side of the Atlantic. It has evolved: The '90s were an American decade at the group's annual meetings. With the fall of the Eastern bloc, the WEF's purpose became to reorient elites from around the world toward U.S.-style market policies. But in this century, the WEF appears to have started at least considering the possibility that the U.S. way is less of a miracle formula than had been thought, and that European social capitalism might be a saner option. The Davos meeting has become a far larger, more international, and more media-oriented event. Also new to Davos are the protesters. This year the police went to extreme measures to keep the protesters out--fencing off the resort with barbed wire and using water cannons spiked with liquid manure to prevent protesters from ascending the hill to the Alpine village. And the WEF spawned an anti-Davos gathering, a first, in Porto Alegre, Brazil--a model environmental city with a well organized socialist government. Largely planned and attended by non-U.S. groups, it brought together more than 10,000 participants, rather than the 3,000 who were expected. The protests at Davos and the meeting in Porto Alegre are part of a broader global movement that contains an enormous variety of politics--this is not simply a party, or labor, or "the left." The movement is made up of people who feel entitled to practice politics on the streets of nations where they are not citizens. They are conducting themselves as denationalized citizens in a way that interestingly parallels the formalized rights and entitlements that allow corporations to function on an international level. In other words, we are seeing the globalization of citizenship. This movement can be viewed as unreasonable, ineffective, fringe, whatever. But to do so is a mistake. The demonstrators have already succeeded in putting some of their concerns on the discussion agenda at the WEF meetings and elsewhere. Amid this public clamor, quite a few WEF participants would like the annual meetings to feature more critical debates. And to foster such an engagement, this year the WEF invited dozens of organizations that are critical of current forms of globalization. Thus this year's agenda for the Davos meeting included as a prominent theme the growing divide between the world's rich and poor. The World Bank has rediscovered poverty, and is actually allocating resources to address some aspects of it. Some corporations are getting worried and including better environmental and labor standards in their planning. These organizations and firms are acting, in part, out of self-interest to protect themselves. Yet their actions might well be the beginning of more serious responses to mounting pressure. The goal for thoughtful critics should be to detect fissures in the apparatus of power. And in Davos we see an enormity of power confronting the threat of massive epidemics that will inevitably touch the rich, the latest global climate report which paints a truly alarming picture, and the growth of anti-globalization efforts and resources. Addressing global challenges and securing dialogue among enemies is what the WEF is about. The WEF has long boasted of being ahead of the times in its understanding of major issues, and it has prided itself in being a special type of setting for enemies to meet and engage in difficult dialogue. Indeed, the WEF meetings bring together such an astounding mix of the powerful from so many countries that it provides a special opportunity to innovate. The WEF has brought together warring political actors, such as the Palestinians and the Israelis to discuss the now-defunct Oslo agreement, and it conducted some of the brokering around the wars in ex-Yugoslavia, and so on. Of course, the WEF also was one of the vehicles that persuaded elites, after decades of resistance, to open up their countries to foreign investment and global trade, to deregulate and to privatize, in situations where these elites had often resisted such policies for decades. Indeed, in the past decade many of the world's governments turned 180 degrees in their policies regarding foreign investors, privatization, deregulation and opening up to global markets. We cannot simply assume that they all suddenly decided the global market is better--that market has existed for a long time--or that it is the result of the United States and the IMF exercising raw power. It entailed persuasion and resocialization of government officials, an education about what it meant to adequately run a national economy. A whole new culture of government had to be produced, one that drastically redefined the desirable relation between states, global firms and global markets. In brief, it took "cultural work." Davos is one place where the work of denationalizing elites gets done. But for any of this to succeed will take hard work, not just a few Davos panels filled with the chattering classes examining the negatives. We need to recognize the power these forums have to reorient the state, corporate and media agenda. It is time for yet another massive reorientation, one that recognizes that environmental damage, terror, massive poverty and neglect of public health affect us all, not only the poor. These are conditions that you cannot buy your way out of; you simply have to work at changing them. The scale, globality and acuteness of these conditions are such that they become the equal, so to speak, of the power, resources and talent of the global elites that gather at Davos. Would it not be possible to reorient the Davos meetings (as well as the WTO and IMF gatherings) toward getting these global elites to focus on what is emerging as a new global agenda? There is today a far more audible concern with massive levels of poverty, major breakdowns in public health, a sharp growth in the terrorization of civil populations and escalating environmental damage. Some of these conditions or their effects can no longer be isolated from the privileged. If there ever was a task that required global elites to be active participants, it is addressing and working at solving these conditions. The WEF has found its match. The heads of the thousand corporations that gather at Davos account for an enormous amount of worldwide environmental damage, as well as an enormous share of the resources we could use to address the damage they produce. If this damage came from 3 billion households in the world, it would be far more difficult to deal with than if two-thirds of it came from a limited number of enormously powerful organizations that could, if they decided to do so, reduce the damage substantively. Davos represents a unique concentration of elites from diverse economic sectors, media outlets and national states--all brought together in one tiny place and primed to be exhorted to change. They did it once, from a national to a global orientation. Can't it be done again, from a destructive globalization to a more humane, just and environmentally sound globalization? Then the hard work of communicating across enemy lines can begin. This wouldn't solve all problems. But it would mean looking at the WEF and other such organizations as resources precisely because they concentrate both the power to produce so much of the damage and injustice, and the resources to reduce them. Saskia Sassen is the Ralph Lewis Professor of Sociology at the University of Chicago. Her most recent books are Guests and Aliens and Globalization and its Discontents. Now read Naomi Klein's "How to Confront Globalization: Take it to the Streets"